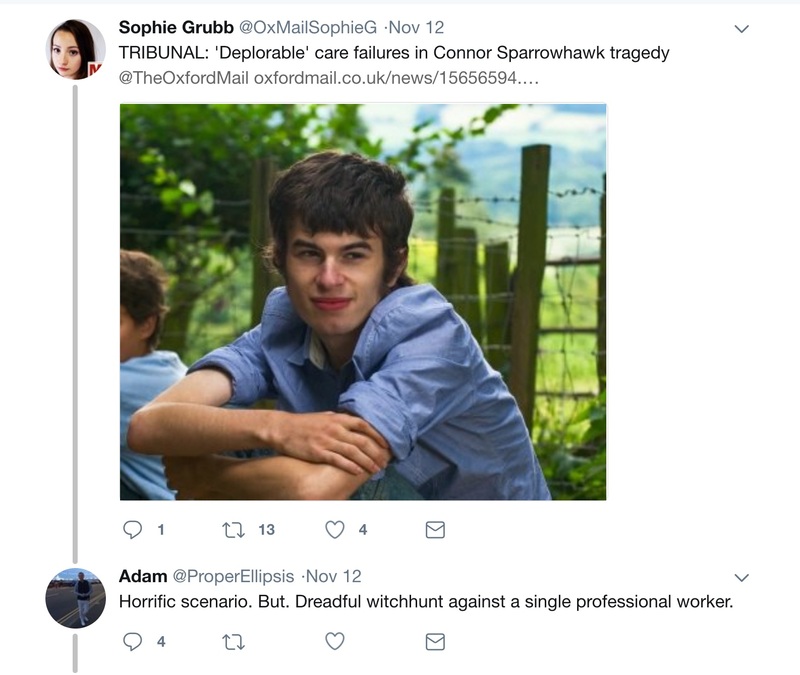 This entry was posted in Campaign stuff, Death, General Medical Council, GMC, NHS England, NHS Improvement, NMC, nursing and midwifery counsel, Oxfordshire County Council, Southern Health NHS Foundation Trust by sarasiobhan. Bookmark the permalink. Published on 1 November 2017, this is the title of The Right Reverend James Jones KBE’s report into how families were treated after the Hillsborough disaster. There are many parallels with how bereaved families were treated at Sloven (and perhaps the NHS in general) particularly in respect of how Inquests are handled and the professional arrogance to which Sara refers. And, as for non-NHS commentators being dismissed as “armchair critics who wouldn’t last 5 minutes in the NHS”, we should remember the case of NHS whistle-blower, Maha Yassaie. She lost her job after raising concerns about patient safety only for an investigator to tell her she was too honest to work for the NHS! Perhaps we wouldn’t last 5 minutes for this very reason! Sara this attack on you is to be expected. .
You have not been beaten back by the usual stingers thrown across the path of all parents battered and bereaved through indifference or incompetence. These powerful people are unused to being questioned, far less held to account. And they are a bit upset.. The power status quo has been well and truly rattled. Comfort has been disturbed by dignity and resilience. Ritual anti challenge boulders have been steadily swept away. By you for your beautiful boy….-. and for all the lost boys and girls and grieving mums and dads, who have waited for ever for someone to say sorry. And mean it. ……..and, you have written it all down. Adam has clearly not been following this case. I have for two years and commend your summary of Right Things. Dissolves into a heap of too much for too long. Too bloody right Alan. From what I’ve seen arrogance in medical professionals kicks with some at medical student stage and (usually) gets knocked out of them when they come into contact with reality. You can be as arrogant as you like with people who cannot articulate that what you are prescribing to them is harming them. Who are checking the doctors and their methods? Presumably medical organisations that do not give a toss for people with LD. Pauline – you are right: in the case of NHS Trusts and Foundation Trusts, the Medical Director is usually the Responsible Officer for doctors (including Consultants). This includes doctors’ revalidation. This is a clear conflicts of interest since adverse reports reflect poorly on the Medical Director’s supervisory skills. But then, what do you expect of a Medical Director (previously Clinical Director) of Sloven, who uses psychic powers to diagnoses people she has never met or even spoken to – all in an (unsuccessful) attempt to assist her CEO to avoid a meeting, inter alia with the Department of Health and NHS England. that is how all psychiatrists behave I’m amazed she admitted to anything all they are good for is giving drugs.. disgraceful “professionals” my arse callous, careless and indifferent all you need to know oh and avoid them at all costs. the eugenics argument is a valid one don’t forget in nazi Germany they tested the zylon b on mentally ill people first and most of the psychiatrists who colluded in this fled to the USA post war.